It’s sturdy, energy efficient, aesthetically pleasing, expressive and, yes, more expensive. 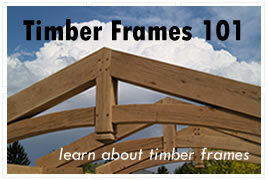 But advocates of timber framing say it’s worth every penny, and it can still be affordable. 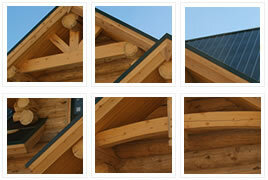 Timber framing has been practiced for centuries in the Northern Hemisphere. “Some structures in Europe are 800 years old or older,” said Steve Rundquist, owner of Brewster Timber Frame Co. in Bellvue, adding that in Cape Cod, where he learned the craft, timber frame buildings are 300 to 350 years old. For a variety of reasons, however, the craft faded from use during this country’s western expansion, and Rundquist would like to see that change. He is one of small group of local builders and engineers reviving the tradition. Peter Haney, founder of Rocky Mountain Workshops, said some Colorado pioneers used timber framing for barns, which are still standing. One of the county’s first settlers built a timber frame barn near Bellvue in 1862. About 1865, a city founder used a combination of steel and traditional timber framing for a barn standing in the middle of the golf course at Lincoln and Lemay in Fort Collins. An “amazing barn,” 150 feet long by 50 feet wide, was constructed south of Berthoud in 1874, Haney added. Rundquist explained that his craft uses heavy timbers to build the bones of a structure. Wood joinery techniques are used to tie the timbers together for the frame. It can be enclosed in several ways, but the sturdy, beautiful beams remain exposed on the interior. He is quick to explain that this is not a log home. “Log houses are visually appealing from the outside,” Rundquist said, adding that it is possible to add log siding to a timber frame home if a person wants that effect.